A virus is an acellular microbe, which cause disease by invading cells. They are among the smallest microbes, much smaller even than bacteria. Viruses are not cells. They consist of one or more molecules of DNA or RNA surrounded by a protein coat. 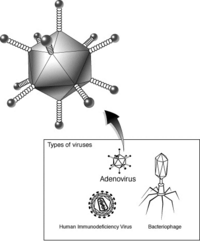 Viruses can be rod-shaped, sphere-shaped, or multisided. Some look like tadpoles. Unlike most bacteria, most viruses do cause disease because they invade living, normal cells, such as those in your body. They then multiply and produce other viruses like themselves. Each virus is very particular about which cell it attacks. Various human viruses specifically attack particular cells in your body’s organs, systems, or tissues, such as the liver, respiratory system, or blood. Although types of viruses behave differently, most survive by taking over the machinery that makes a cell work. Briefly, when a piece of a virus, called a virion, comes in contact with a cell it likes, it may attach to special landing sites on the surface of that cell. From there, the virus may inject molecules into the cell, or the cell may swallow the virion. Once inside the cell, viral molecules such as DNA or RNA direct the cell to make new virus offspring. That’s how a virus infects a cell. Viruses can even “infect” bacteria. These viruses, called bacteriophages, may help researchers develop alternatives to antibiotic medicines for preventing and treating bacterial infections. Many viral infections do not result in disease. For example, by the time most people in the United States become adults, they have been infected by cytomegalovirus (CMV). Most of these people, however, do not develop CMV-disease symptoms. Other viral infections can result in deadly diseases such as AIDS (acquired immunodeficiency syndrome) or Ebola hemorrhagic fever. Because viruses are acellular and do not use ATP, they must utilize the machinery and metabolism of a host cell to reproduce. For this reason, viruses are called obligate intracellular parasites. 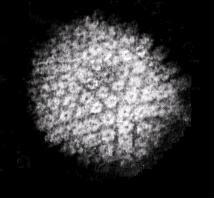 Before a virus has entered a host cell, it is called a virion--a package of viral genetic material. Virions—infectious viral particles—can be passed from host to host either through direct contact or through a vector, or carrier. Inside the organism, the virus can enter a cell in various ways. 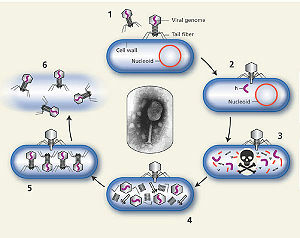 Bacteriophages—bacterial viruses—attach to the cell wall surface in specific places. Once attached, enzymes make a small hole in the cell wall, and the virus injects its DNA into the cell. Other viruses (such as HIV) enter the host via endocytosis, the process whereby cells take in material from the external environment. After entering the cell, the virus's genetic material begins the destructive process of taking over the cell and forcing it to produce new viruses. There are three different ways genetic information contained in a viral genome can be reproduced. The form of genetic material contained in the viral capsid, the protein coat that surrounds the nucleic acid, determines the exact replication process. Some viruses have DNA, which once inside the host cell is replicated by the host along with its own DNA. Then, there are two different replication processes for viruses containing RNA. In the first process, the viral RNA is directly copied using an enzyme called RNA replicase. This enzyme then uses that RNA copy as a template to make hundreds of duplicates of the original RNA. A second group of RNA-containing viruses, called the retroviruses, uses the enzyme reverse transcriptase to synthesize a complementary strand of DNA so that the virus's genetic information is contained in a molecule of DNA rather than RNA. The viral DNA can then be further replicated using the host cell machinery. When the virus has taken over the cell, it immediately directs the host to begin manufacturing the proteins necessary for virus reproduction. The host produces three kinds of proteins: early proteins, enzymes used in nucleic acid replication; late proteins, proteins used to construct the virus coat; and lytic proteins, enzymes used to break open the cell for viral exit. The final viral product is assembled spontaneously, that is, the parts are made separately by the host and are joined together by chance. This self-assembly is often aided by molecular chaperones, or proteins made by the host that help the capsid parts come together. The new viruses then leave the cell either by exocytosis or by lysis. Envelope-bound animal viruses instruct the host's endoplasmic reticulum to make certain proteins, called glycoproteins, which then collect in clumps along the cell membrane. The virus is then discharged from the cell at these exit sites, referred to as exocytosis. On the other hand, bacteriophages must break open, or lyse, the cell to exit. To do this, the phages have a gene that codes for an enzyme called lysozyme. This enzyme breaks down the cell wall, causing the cell to swell and burst. The new viruses are released into the environment, killing the host cell in the process. Attachment, sometimes called absorption: The virus attaches to receptors on the host cell wall. Penetration: The nucleic acid of the virus moves through the plasma membrane and into the cytoplasm of the host cell. 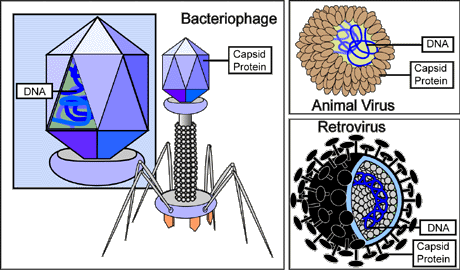 The capsid of a phage, a bacterial virus, remains on the outside. In contrast, many viruses that infect animal cells enter the host cell intact. Replication: The viral genome contains all the information necessary to produce new viruses. Once inside the host cell, the virus induces the host cell to synthesize the necessary components for its replication. Assembly: The newly synthesized viral components are assembled into new viruses. Release: Assembled viruses are released from the cell and can now infect other cells, and the process begins again. Did God Make Pathogenic Viruses? by Jerry Bergman. Journal of Creation. 13(1):115–125. April 1999. This page was last modified on 27 July 2014, at 17:12.